Well our friends over at Tasca continue to please. They have released the second kit in their new 1/24 scale line, this time it’s the turn of the Zundapp KS750 motorcycle with sidecar to get the Tasca treatment. The first Zundapp appeared in 1940 after winning the Wehrmacht contract for the military bike over their main competitor the BMW R75. By the time it was over they would produce about 9 million of the still very popular motorbike, okay, they only really produced a bit over 18,000 but judging by the number still seen in film and television it sure seems like more. The bike and sidecar combination had a top speed of near about 60 MPH, and managed a bit over 35 MPG in ideal situations. The bike had a 751 cc air cooled opposed twin cylinder engine and an enclosed drive shaft (that is what the ‘K’ in the name denotes. The bike also featured a locking differential that would deliver power to the sidecar wheel for greater mobility when being driven cross-country. The kit comes well packaged in a standard lid opening model kit type box. I was a bit surprised by the size, I guess I was looking for something much larger, however, the box is smaller than a typical 1/35 vehicle kit. The contents inside tell the reason, they are just not that big, the finished kit only measures out to about 3 1/2 inches long (90 mm or so) and less than 2 inches in height. The kit has 6 sprues in dark gray, one small clear sprue, decals for 6 different bikes, two small sheets of laser cut paper, wire for the brake lines, a pair of springs to fit up under the seat, a set of standard instructions and an extra sheet with markings placement and painting instructions. The instructions are the foldout variety, divided into sixteen sections. Painting of small and hard to get to areas is called out during construction. All the parts are beautifully molded with absolutely no flash anywhere as befits a completely new mold. The knockout pin marks are minimal and everyone I found show some forethought as they are all on the inside or hidden areas of the finished kit. There are very few mold lines to clean up, even the cooling fins on the cylinder heads have only the faintest hint and should clean up easily. The sidecar looks really nice, the drawings in the instructions depict the tell tale spread of the side walls, and the molding of the part makes it look like it should be pretty clear to see. The bike can be displayed without the sidecar; if you choose to separate them the bike includes the caps that secure the fittings for complete accuracy. The rest of the sidecar details look very nice, the saddlebags, or panniers, are very nice, good latch details and the laser cut paper provides the tiny latches, and very well done floorboards for the interior, all very cool. The engine, drive shaft, and gear case all appear to be very well done, can’t comment yet on the fit, but wow, really nice moldings. Some of these parts look extremely delicate so I would caution that you use extreme care when removing from the sprue. You have the option of putting the tropical air cleaner or the standard one on the engine, depending on which bike you are modeling. 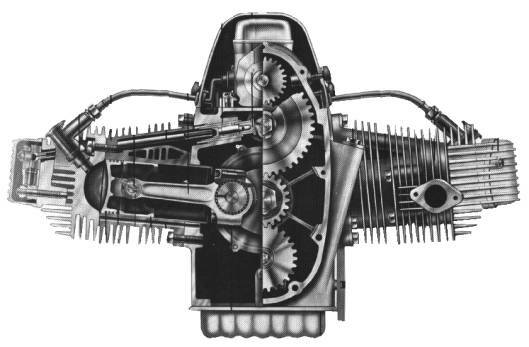 The finished engine is trapped between the left and right side of the frame. One nice detail that Tasca didn’t overlook was the embossed Zundapp logo on the gear shift assembly. Tasca also provides a length of wire in order to ‘plumb’ the bike, along with that they also point out where exactly you need to drill out the holes to accept the wiring, a nice touch. Perhaps the most intriguing molding on the kit is how Tasca has chosen to recreate the wheels. In order to create the double set of spokes you sandwich the left and right side of each wheel together and then fill in the tread area of the tire with six small sections that all work together to build up one wheel. Other manufacturers may be doing this already but it was the first time I had ever seen this method employed, I’m more than a bit anxious to see how it looks when put together. The seat looks very nice, it comes complete with the under frame, retaining springs, and for want of a better term, a two piece seat frame housing. The seat is finished off with two metal springs for that comfortable ride we all long for! The front forks assembly also looks very nice. Headlight, handlebars, separately molded brake and hand grips, what’s not to love. Once again, some very delicate parts so take extreme care in removal. The speedometer is mounted in the headlight assembly. It is all there, with a nice clear piece to replicate the instrument glass but Tasca has not included a decal to replicate the gauge and the plastic instrument face that fits into the headlight has the faintest, and I mean faintest, raised detail I have ever seen. It is so faint that I needed my Opti-visor to discern if it was actually there and I am still not really sure it even was. They could have included a decal to go along with the instrument glass and solved the problem easily. My one real nitpick with the kit. Also included are two jerry cans, complete with laser cut paper inserts. They are both embossed with all the correct markings, at least as far as I know! One is marked as a water can while the other is for gasoline. The decals provide for five different bikes, for four Eastern front machines in the dark gray and one Afrika Korps bike desert yellow. The one bike for an SS unit has decals that have the runes cut into two pieces in order to meet modern anti-Nazi laws, I’m guessing that we won’t see too many of those modeled as it looks like a real headache to get them to line up correctly. This is a real winner and should be a solid seller for years to come. The kit sports quality molding throughout with lots of detail to make everyone happy. The wheels look superb, and the engine could be a kit all its own. Just wish they had included a decal for the speedometer. Anyone with a bit of plastic experience should end up with a masterpiece when they finish. Other than that one concern let's all tip our hats to Tasca for a job well done! Highs: Beautifully molded and engineered kit for the first time in this scale. Lows: No decal for the speedometer, some very delicate parts. A bit of experience would be helpful due to level of fine detail. Also, no figures are included. Verdict: A very, very nice kit. I really like the treatment of the wheels and can't wait to get this one built. Rick, thanks for the review. Could you upload a picture of decals too?